Born and raised in Frederick County, Maryland, I specialize in on-site research to be conducted in Frederick, Carroll, Washington and Montgomery Counties, MD; Adams, York and Franklin Counties, PA; as well as Loudoun County, VA. Most of my ancestors traveled through southern Pennsylvania and settled in Frederick County as early as 1732. 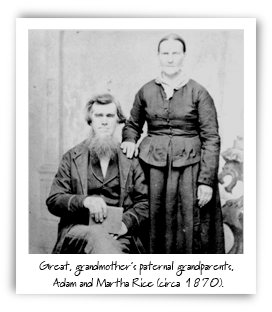 I've been conducting genealogical research as a service to others for 40+ years with over 13 years on a full-time basis with the same dedication to excellence as if I were researching my own family. 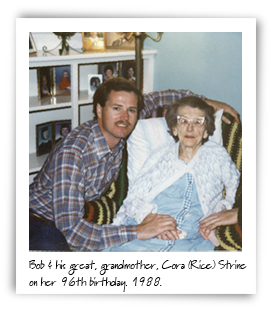 My love of family history began with my great, grandmother, Cora (Rice) Strine, the 6th of 11 children, who lived to be 96. I spent every Friday night at her house in Frederick from childhood through my teens. Her ancestral home was located in the mountains of Frederick County. 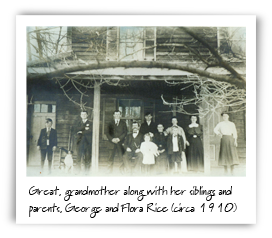 For a time, my great, grandmother's lived in a 3 generation household containing her siblings, all born around the turn of the 20th century; her parents, both born in the 1860's; as well as her paternal grandfather who was born in the 1820's. The lives of each family member was orally conveyed to me at the kitchen table and on the front porch over many years are priceless memories to me today. In my college years, I began to write down these stories. I later switched to using a cassette tape recorder and finally I documented these family stories using a camcorder. Storytelling has become an integral part of my life as was that of my ancestors. I hold Bachelor of Science degrees in Zoology and Chemistry from the University of Maryland. Upon graduation, I devoted 29 years to a career in the Biotech and Bio-Defense industries before retiring at age 50 to pursue my life's dream as a full-time genealogist. Over 14 years of my first career were devoted to the support of a line of 500+ products, as the company's Director of Technical Services. I responded to 10,000's of letters, phone calls, faxes and e-mails regarding product quality and use. My support was based upon personal use and experience with each and every product sold. •	Member of the Association of Professional Genealogists and faithfully adhere to their Code of Ethics. •	Member and volunteer in the research library at the Historical Society of Frederick County, MD. •	Member of the Frederick County Genealogical Society (FRECOGS). •	Past volunteer in the Maryland Room at C. Burr Artz Library also in Frederick, MD. •	Member of the board of Mt. Prospect Church Cemetery Association in Lewistown, Frederick County, MD. This association's mission is the preservation of the Mt. Prospect Methodist Episcopal Church; built in 1833 as well as the maintenance and upkeep of its adjoining cemetery. •	Volunteer restorer of broken grave markers, free of charge, in family and church cemeteries throughout Frederick County. •	Hunter of Civil War relics for the past 44 years on private farmland in Frederick and Washington Counties, MD, using a metal detector. In 1975 I unearthed a homemade Civil War "dog tag" (not issued by the military on either side during this conflict). On one side, the tag identifies the owner's name, rank, unit and state; on the reverse side it says "Erin Go Bragh," ("Ireland Forever"). © Copyright 2018 Bob Fout. No portion of this site may be duplicated or reproduced without written consent.